See, I really do care what you guys think! You voted Strange Flavor Chicken as the dish I should learn to make first, and happily enough it's both an appetizer and not that complicated. I wish you were here to share it with me. The combination is all in the black sauce you see: sugar, salt, soy sauce, black vinegar, black sesame seed paste, chili oil, sesame oil, and Szechuan pepper (Tieyu's magic powder). 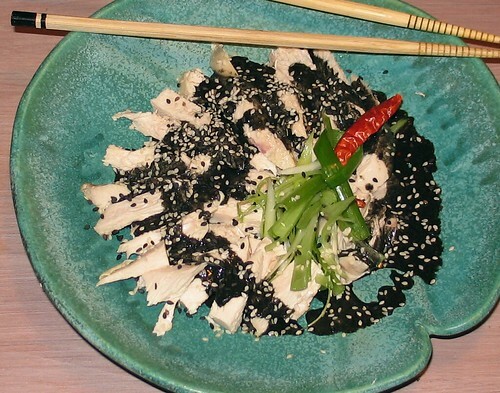 A little mound of cold scallion slivers, a little mound of cold poached chicken meat, a healthy drizzle of the thick, black sauce that strikes you as rich and nutty till the chili oil and peppers hit. Oh my God, it was fabulous! My sister stopped by and we ate the whole plateful. Enormously satisfying, incredibly flavorful. And, my vegetarian friends, you know what? I think this sauce might be just as nice with tofu. Next up: hot and sour soup. Oh, the glutinous balls will be on the menu one of these days! I'm encouraged by the success of this first try. I envision a feast: strange flavors, balls, and all.